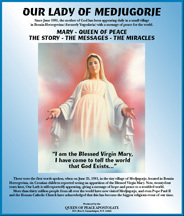 This is a special 12 page newsletter that was written and published by the Queen of Peace Apostolate. It was distributed in local newspapers as a special insert. A limited supply of copies are still available. Our only request is a donation to help cover the cost of shipping. As with many of the Marian apparitions throughout the world, physical and spiritual healings have often accompanied the apparitions as a tender blessing of God’s love and mercy to a faithful people, and as a sign of what devotion to God will naturally yield: good...through faith, prayer and acts of charity. There have been literally many hundreds of physical healings at Medjugorje, and many were well documented with medical certificates. There have been so many, in fact, that even the most ardent disbeliever now understands Our Mother’s messages - that with faith, prayer and fasting, MIRACLES DO HAPPEN! News of the apparitions had spread rapidly since that first day on June 24, 1981, and within a week there were more people than ever on Mt. Podbrdo –– the hill of apparitions. On the sixth day, one family had heard and come from a town a long way away. Mr. and Mrs. Setka had brought their three children to pray for a miracle. Their three year old son Danijel could not talk or walk. They asked the visionaries if they would ask Our Lady to cure Danijel. The light flashed and the children ran to the Madonna. They were joined by thousands of people who said the rosary, sang hymns and said the seven Medjugorje prayers. “Dear Madonna,” the children begged, “Will this little boy Danijel, ever be able to speak? Please make a miracle so that everyone will believe us. These people love you very much Dear Madonna!” Our Lady looked at tiny Danijel and smiled. “Let them pray and firmly believe that he will be healed. Go in the peace of God.” “She has gone,” said the children. The parents thanked the children and knelt and prayed with the people. On their way home, the Setka family stopped at a restaurant to eat. “Give me a drink,” said Danijel. His parents stared in amazement. He had never spoken before. It was truly a miracle. Gradually Danijel Setka learned how to walk and talk. The paralysis completely left him. This was the first of many known healings at Medjugorje. There is the story of Ireland’s David Parkes, a famous Irish singer, also an atheist, who was suffering immense pain from Chron’s Disease. He had ten surgeries, the last lasting eleven hours, and was informed that the doctors could no longer be of help, it would only be a matter of time until he died. He went to Medjugorje “on holiday”, but to placate his wife he agreed to “a blessing.” He felt an incredible heat in his body, and fell unconscious for twenty minutes. He awoke, free of all physical pain, and experiencing the greatest peace he had ever known. Although weak, he climbed to the top of Mt. Prodbro, and asked the Blessed Mother to teach him how to pray. David made a pact with the Blessed Mother that in gratitude for his great blessings, he would record the pro-life song “Let Me Live.” If it saved even one unborn child it would be worth everything. In May of 1993, that song was sung at the National Concert Hall in Ireland, with 50,000 people in attendance, and was carried live over national television, at the request of Mother Teresa of Calcutta, who had come to Ireland’s Marian Shrine to speak out for life. She smiled the whole time it was sung. There was Kevin’s story, a child from upstate New York who was critically ill from several chronic conditions including seizure disorder, chronic lung disease, immune deficiency, and neuromuscular disorder. Kevin was not expected to live. The father was addicted to alcohol and drugs. The parents’ marriage was falling apart, and they might go months without even speaking. In Medjugorje, they all embraced during Mass when the apparition of the Blessed Mother began, and only Jesus and Mary knew of the intensity of their prayers - to be a family - whole and in peace once again. The three of them, child and mother and father, had climbed Apparition Hill. When the Blessed Mother arrived they could see the cross on top of the Hill glow. It was so bright they stated they could feel the warmth flowing from it. As the glow faded, the rains stopped and all on the hill realized that all their ponchos and clothing were completely dry. People began crying and pointing to the cross, and they all saw tiny silver stars, like sparklers, shooting off all around it. Everyone immediately knelt and began to pray. The next day at Mass Kevin had a seizure that lasted several minutes. As the family began to board the bus to return, a woman from the pilgrimage came up to see little Kevin, excited about what happened to him. The woman stated that she saw Kevin look up into the church statue of the Blessed Mother, and speak to her and then fall asleep for about three minutes. When asked, Kevin replied to his parents that he had spoken to Our Lady and she had spoken to him, telling him to be good and promising that he’d feel better soon. It was later that his parents realized that little Kevin wasn’t experiencing a seizure, but that it was his body quivering as the sickness left his body that day. The father has recovered from his drug dependency and is now a Eucharistic Minister and Pastoral Care Minister, attending Mass on a daily basis as possible. They have started a Cenacle meeting, and a prayer group, and most importantly now, is their family prayer time. The family is close and intimate once again, the doctors have remarked on Kevin’s amazing improvement, and now with all the anger and hurt gone - they all feel extremely blessed and in God’s great mercy and grace. Perhaps the best known of the physical miracles is Rita Klaus, and extraordinary testimony of God’s unwavering love and mercy. Rita Klaus was confined to a wheelchair, with Multiple Sclerosis, and due to her deep devotion to God and the Blessed Mother, was miraculously healed. But there are so many more. • Dubravko went to Medjugorje and was healed of leukemia. Hundreds of other cases have been reported such as this, “I was an alcoholic. In spite of my own efforts and many treatments, I couldn’t stop drinking. I stopped the day after going to Medjugorje.” Through Medjugorje, people have been cured of chronic pain, of drug addiction and tobacco addiction, of phobias, tumors and diseases. Besides all the physical healings, the spiritual healings are even more notable. There was the man who for seventeen years was without any sacraments or faith. He was a cocaine addict who had planned the following week to kill his brother-in-law. For whatever reason, a friend had given him a video on Our Blessed Mother and Medjugorje. He watched it one Saturday morning and dropped to his knees and wept the entire time. He decided to go to confession and reconciled his life with God, and today he is a saintly man and a daily communicant...after seventeen years away from God’s grace. It meant the healing of Mike B. and the healing of 20 years of anger, bitterness and rage that he carried around with him. It meant the conversion of an inmate, Mike G., and the strong faith and love that is winning the hearts and souls of men in prison. And it means, literally, millions more of spiritual healings and conversions, and of people finding joy through finding their way home. The physical healings are a sign of the power of faith and prayer, and the spiritual healings - the grace and mercy, the relief of so much pain and burden, are yet, even greater signs for all of us of the love of God. FOR THOSE WHO BELIEVE NO PROOF IS NECESSARY . . . FOR THOSE WHO DON’T BELIEVE NO PROOF IS ENOUGH! Besides the physical and spiritual healings, there have been many other miraculous signs in Medjugorje since that first apparition in 1981. The speed at which the children ran up the rocky hill of Podbrdo on June 25th was impossible, yet many witnesses said it was true. Witnesses claim that it was almost as if the children “floated” up the hill, on top of the rocks and boulders and over the thorn bushes instead of through them. On the third day of the apparitions, a bright light was seen throughout the whole area, and people from other villages and towns came to see what was happening. Even government officials confirmed this fact. August 2nd, 1981 was he first date of the miracle of the sun, dancing and spinning and the sun assumed the formation of the shape of hearts. Since that time this unusual occurrence has happened so often that it is almost expected during any important feast day or special time. It has been witnessed by thousands of villagers and pilgrims alike, countless times throughout the years. The sun actually spins in the sky and gives off beautiful colors. Some people have seen the sun turn into a heart, at other times people claim to have seen three circles of the sun that interlock to represent the Holy Trinity, and at other times people have seen the shape of the cross or the spinning and moving of the sun across the sky coming closer to earth and then returning to its original position (similar to the miracle of the sun at the Fatima apparition - except at Medjugorje it has happened many times). On August 6th, 1981, the word “MIR”, which means peace in Croation, was seen in the sky over the cross on Mt. Krizevac. Visionary Vicka Ivankovic meets with pilgrims. The luminary phenomena are another incredible sign at Medjugorje. At times the cross on Mt. Krizevac has turned into a pillar of light and some people have seen the form of a woman standing in the center of the light. This phenomenon has also been seen by many people on many different occasions. Our Lady told the children that she prays at the foot of the cross every day. On October 28th, 1981 an unusual fire broke out on the top of the hill, seen by the police, villagers and the priests. It burned about fifteen minutes but when they reached the top of the mountain to put the fire out, nothing could be found. There was absolutely no trace of a fire on the hill. Cameras have captured these phenomena as well as the silhouette of Our Blessed Mother at other times. And perhaps the most common occurrence is the changing of colors of rosaries. Hundreds of pilgrims have attested to the fact that the links between the beads on their rosary’s had changed color, from the traditional silver to a gold color, while saying the rosary at or on behalf of Our Mother at Medjugorje. Most interesting is the behavior of the visionaries themselves, which shows a sign of something supernatural happening. The visionaries always fall to their knees at exactly he same moment, look up and focus on exactly the same spot, and start their prayers at exactly the same time in a most improbable manner. It has been postulated that with such critical observation from authorities, such precise timing and behavior could not possibly be conceived or efficiently replicated if fraudulent, even with much practice and rehearsing. No, something is happening to all these children at precisely the same instant and in the same manner... something Divine. No other visionary has ever been tested by such sophisticated means and to such elaborate extremes as the visionaries of Medjugorje. Together, the scientific and medical tests in combination with the sightings and luminary phenomena, in combination with the physical and spiritual healings certainly prove beyond doubt that Divine Intervention is occurring in this little town in Bosnia-Herzegovina.